Conflict amongst family and friends is never fun. Sadness, anger and hurt are just some of the emotions that appear during hard times. And who wants to deal with that, right? When there is an elephant in the room, rather than pretending it doesn’t exist, I always opt to stab it with a pitch fork. It's not that I am a confrontational person. It's just that I love the people in my life…hard. And the one thing I cannot tolerate is seeing someone I love hurting while the ones who are supposed to be there for support idly stand by and watch. Living in the south, I’m finding that, unlike my Jersey brethren, many people would rather sweep the aforementioned elephant under the rug. Protruding large lumps? 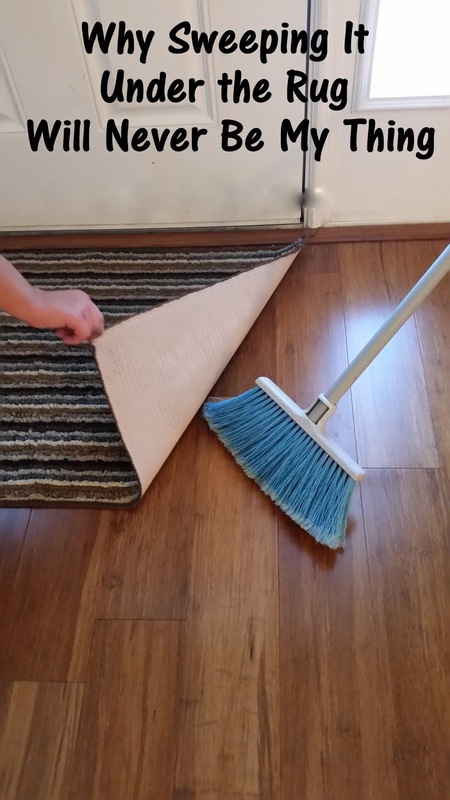 No problem (sweep…sweep…sweep)! Pointy ivory tusks? I don’t see any (sweep…sweep…sweep)! Long swaying trunk? I never noticed (sweep…sweep…sweep)! While ignoring a potentially problematic situation may seem like the easier or more polite choice, eventually, tripping over that elegant Persian rug that you’ve spent so much time perfecting is almost inevitable. And I can’t help but wonder if ignoring the elephant in the room ever leads to a desirable outcome. As I’ve mentioned, I am a get-things-out-in-the-open type of person (it’s probably why blogging has become one of my enjoyments). Admittedly, I don’t quite understand the act of taking a backseat or staying uninvolved when someone you love is in pain (especially if you are the one who caused it). In addition, of all of the chores I do on a daily basis, sweeping is my least favorite. 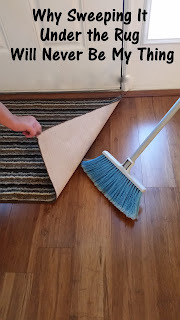 So, you’ll have to excuse my lack of competency when it comes to the “sweeping-things-under-the-rug” concept. For all of you rug sweepers, here are some questions that, if answered, may alleviate my confusion. Just how thick is this rug of yours? Give it to me in inches…or feet. How much are you willing to sweep under it? Like…is it only for large issues? Or can I also find small issues hidden under it, such as not liking the paint color that your husband picked out for the bedroom? If you ever decide to look under your mountainous rug, will you find things under there from the 1970s? I mean, how far back does the dust go? How many awkward situations has this rug caused? Like…if you are sitting across the room from someone, can you have a normal conversation without shouting over the pile? Can you even see each other? How do you lay comfortably on your couch? Is it askew because of the carpet lumps? And as a follow-up to question five, have you ever acknowledged that rugs aren’t supposed to be lumpy? How many relationships have been stained with dormant untruths because of the infinite pile of crap lying underneath? If someone trips on it, are you covered by your homeowners insurance? As you can see by my line of questioning, I am in desperate need of answers. However, because rug sweepers tend to avoid responding to questions that may lead to direct resolutions, I won’t hold my breath. But no need to bless my heart. This Jersey girl will carry on living her life the only way she knows how - loudly. I will always have your back. I will always defend you, even if that means inserting myself into a situation that may only partially belong to me. I will do this because I love you. And you deserve better. You deserve someone in your life who will say the unpopular thing. You deserve someone in your life who will call people out for treating you poorly. You deserve to be assured that there is at least one person in your life who cares enough about you to always be on your side. And I promise, I am that person for you. My loves, I will always choose you. Am I Really Done With Children?